In the Fairmont Hotel in San Francisco, at one corner of its massive lobby, I have been directed by a desk clerk to the row of in-house telephones. Up the elevator, a walk down a tomb-like hall, and I’m knocking on Room 262, the “Oxford Suite.” A large, bald man ushers me in without a word. Another interview is winding up, so I endeavor to meet the hairless man (John Smothers, “Security”) and the female voice (Frank’s wife of eleven years who says, “Don’t call me Mrs. Zappa. Call me Gail. It always reminds me of his mother when people call me Mrs. Zappa!”). Mainly, though, I stand staring at the bushy haired guy in the armchair. Orange pants rolled up over his ankles, snakeskin platforms, cat-eye sunglasses all the right touches, being captured on film by greedy photographers on a field day. This, I tell myself, is Frank Zappa. How old was I when I scrounged up my first Mothers of Invention album, to the downfall of my formative young mind. Fourteen? Fifteen? Now, after playing 54 cities on a 57 city whirlwind tour (beginning in Phoenix, Arizona and collapsing, probably, in Los Angeles), Zappa is in the Bay Area to court the press. Tomorrow, he and his six-man band would play the Maples Pavillion at Stanford University. But today has been set aside for relaxed conversation, much of which centers, naturally, around Zappa’s current projects. This year he worked extensively on a recording package entitled Läther, a proposed four album box set complete with photographs and decorated dust jackets - the works. Läther (pronounced, he insists, Leather) is as yet unreleased, pending resolution of a legal hassle with Warner Brothers Records. But this tour was planned to push that product and that’s what Zappa means to do. What do you have for those of us not really in tune with the painful pleasures? “Well, let’s see. Side A is ‘The Adventure of Gregory Peck [Peccary].’ It’s a chamber orchestra with narration, and it’s a story of a little pig who invents the calendar, and the problems that arise once the calendar is invented. Although the recording is finished, down to the final mix, Läther is still only a gleam in Zappa’s eye. An eight year affiliation with Warner Brothers ended this year amid an intense court battle, shoving the fate of Läther into the hands of the law. “I have a five million dollar breach of contract suit against Warners,” explains Zappa, “and they have threatened to sue Phonogram, who was going to be the distributor of my new label, Zappa Records. That’s the label that Läther is supposed to come out on. “You gotta understand how this thing came about,” he says. “I had a contract with Warner Brothers Records, and it was supposed to expire on December 31st of this year. I had to deliver four units to them by December 31st. A unit is one completed album. “So, I proceeded to deliver four completed albums to them in March of this year. And the contract specified that upon receipt of the tapes they had to pay me. According to Zappa, since Warners wouldn’t release his four album set, he formed his own namesake label and hunted for another distributor. When the deal with Phonogram (a Mercury Records affiliate) began to jell, Warners threatened to release one of the four discs, a live performance, under the title, Zappa in New York. This contract fiasco is obviously wearying for one so involved in his art. His diversity (as manifested by his proposed Läther) breathes life into his musicianship. He has-been called one of the near geniuses of rock and roll. A respected guitarist, Zappa says he didn’t pick that instrument up until he was 18 years old - after four years of playing drums. Since that time he has stretched and tested his abilities throughout a professional career spanning 17 years. The Mothers of Invention was formed ’way back when - in the Beatolithic Era circa 1964 - and eventually went on to record their first LP on the Blue Verve label, a subsidiary of MGM. Between here and there, Frank has racked up a list of impressive feats: composing a load of fine rock and jazz-rock (besides the experimental stuff that can’t be accurately categorized); using his albums as vehicles for developing his skills in production, arrangement, and orchestra conducting; creating and producing the movie, 200 Motels; holding down some of the heaviest touring schedules known to man; finding time to discover and produce other artists in the meantime. 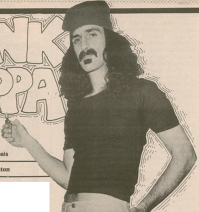 Frank Zappa shirks commercialism, and has developed a nonconformist image of a personal design. This image dates back (at least) to the Mother’s We’re Only In It For The Money LP - where Frank and company donned dowdy dresses for the startling cover photo. Not one to spill the beans, it refuses to elaborate on that tidbit. He assures us, however, that the musical score, screenplay, direction, and a meaty role are all fulfilled by himself. An album will be released as well. Perhaps the greatest tribute to Frank Zappa is to call him a teacher, an innovator. His projects invariably reveal unknown talent, and his uncanny ability for picking this rawness from the rest of the mess. But he smiles and shrugs. “Nobody’s universal. People have different abilities, and if you’re working in a special idiom, you want people who are comfortable in that idiom. As Frank sits in his armchair, my tape recorder resting in his lap, our photographer is capturing the renowned Zappa physique. While the camera clicks, and Frank plays the game, he talks about his family. “I got a brother who sells college textbooks for McGraw-Hill. He spent three years in the Marines. I got another one who’s working in an old folks home.” (“In the kitchen,” says Gail). Zappa, from the California town of Lancaster, (smack-dab in the Mohave Desert), still believes in the dream of rock and roll. That is the main force in his work and his life. All else is secondary. 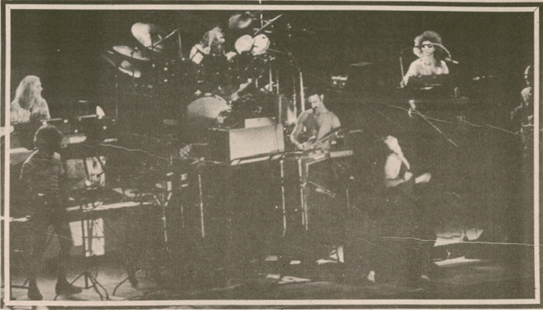 The following night, at Stanford, they packed in to see Zappa rock and wiggle everything. The overcapacity, Big Game crowd dug in and partied, only mildly distressed when the concert ended rather abruptly during the “Dinah Moe Humm/Camarillo Brillo” encore. “The floor in Maple Pavillion is spring-loaded. The audience was bouncing and rocking, and I looked up and noticed that the lighting and P.A. were swaying back and forth. “I cut the show short. I think they should give me credit for doing the public a service. At another concert last year, I understand something fell from the stage and injured several people. When and if someone starts a College of Musical Knowledge, a Rock U, Zappa could very well be the Dean of Instruction. Maybe the guy’s right. Maybe the best thing to do is wise up and boogie. Regardless of our parents’ most fervent wishes, Frank Zappa will probably be around for a long, lewd, loquacious time.